For those who like their country gift-wrapped and stylishly commercial, the kind of music that comes with the seal of fashioned Stetsons and Colgate smiles, stay away from Jamey Johnson. Stay well clear. He’s not for you. And his latest album, the riveting That Lonesome Song (Mercury Records), a 13-tune hang-on ride of honest self-disclosure, needs avoiding at all cost. Johnson is a denim-clad warrior. He’s a modern day outlaw. His music is open, raw, revealing and, to be completely honest, appealing. Having earned the respect (and the royalty checks) for his songwriting (Trace Adkins, George Strait), this Alabama native and former marine now cuts his own path on this, his second album. If you need a signpost to what’s on offer here, a read of his liner notes spells it clearly. Well, if the lyrical content and mood of this album is anything to go on, it must have been one heck of a ride. There’s vocal gravel, pain and suffering in these tunes. The album opens with a 39-second set-up piece, “Released”. In this “theater–of-the-mind” monologue, we hear the gruff and commanding voice of a prison guard. “Mr Johnson, as of now you’re free to do whatever you want to do…but stay out of trouble”. Despite Johnson’s opening line of “I was just an normal guy; life was just a 9 to 5 ...”as heard on “High Cost Of Living,’” Johnson’s lived-in lyrics show another side of life, one battered and bruised with conflict and domestic tribulation. There’s sadness in these songs. There’s a troubled suffering. There’s an acute darkness. There’s the ache and pain of a guy strung out and living close to the borders of mental exhaustion. Marry Johnson’s rock bottom and hurtin’ lyrics to his drawling baritone and you have country at its best. Many industry stalwarts are hailing and anointing Johnson as the new outlaw honcho – a revamped and timely Man In Black – given the goods on show here, they may just be right. When Johnson shades and bemoans about a life and a wife lost to “cocaine and a whore” (High Cost Of Livin’), it’s the stark sharing of a guy who loved and lost, but in his lyrical salvation, eventually finds the way. However, on the way though there’s some angst and pent up anger to deal with. “Mowin’ Down The Roses” proves the point, that payback, though selfish, brings its own reward. Blunt and emotionally brutal, the track finds Johnson on a controlled rampage, one that has him pouring perfume down the toilet, to clawing pictures off the wall, to the final telling revenge, that of mowing down the prize roses. There are no limp tunes here. There’s no floss. There’s no fillers. The well-filtered pedal steel sees to that. Every cut here comes charged, tingling with the musical energy of another time and another breed of singer. Think outlaws. Think Waylon. (Two tracks on the album are Jennings’ reworkings: “The Door Is Always Open” and “Dreaming My Dreams”). The last tune of the album is “Between Jennings And Jones”. If you’re looking for a place to harbour the talents of Jamey Johnson this tune fits. Rather than just channel the reminder of a sadly past era, Johnson is his own man. He sings his honest hurt his own way. By his own admission, he’s lived a fair share of the lyrics. He proves it with a sound defiantly and definitely not Nashville. 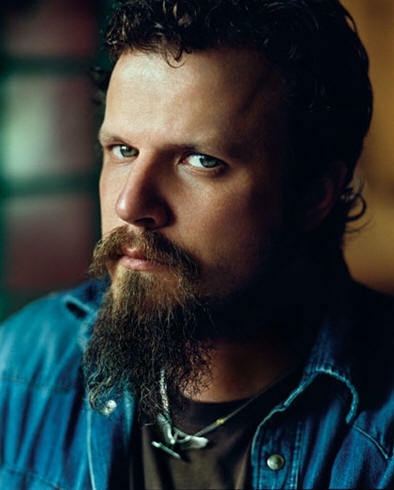 Jamey Johnson is a talented maverick, one who breaks the perceived country star mold. He does it, and easily, with an album that earns this reviewer’s respect and endorsement.